You know what, I was bored. I had surfed since I was 6 and I had been paddling for the best part of the last 10 years. Paddling became my go to exercise and I was doing a big amount of Ks each week. But then, like other sports you needed boards for lots of stuff, flat water, general purpose, and ocean paddling. That sort of complexity alongside the fact that we had downsized our life from a massive house with a big garage to a smaller inner city apartment with limited storage really lead me to question the whole need to keep paddling. But…. Because the there is always a But, Ange and Jacko rang me and said ‘hey we have the Storm 2 and we made some changes, do you want to grab one’. The only answer to that was ‘Absolutely’ so I packed up and went down to the shop to pick one up and drop off some other boards. I was lucky that both Ben (shaper) and Ange and Jacko were all there to walk me through the changes. Are they ground-breaking? No, but the are subtle and do they make a difference – HELL YEA. So, what has this meant to me? 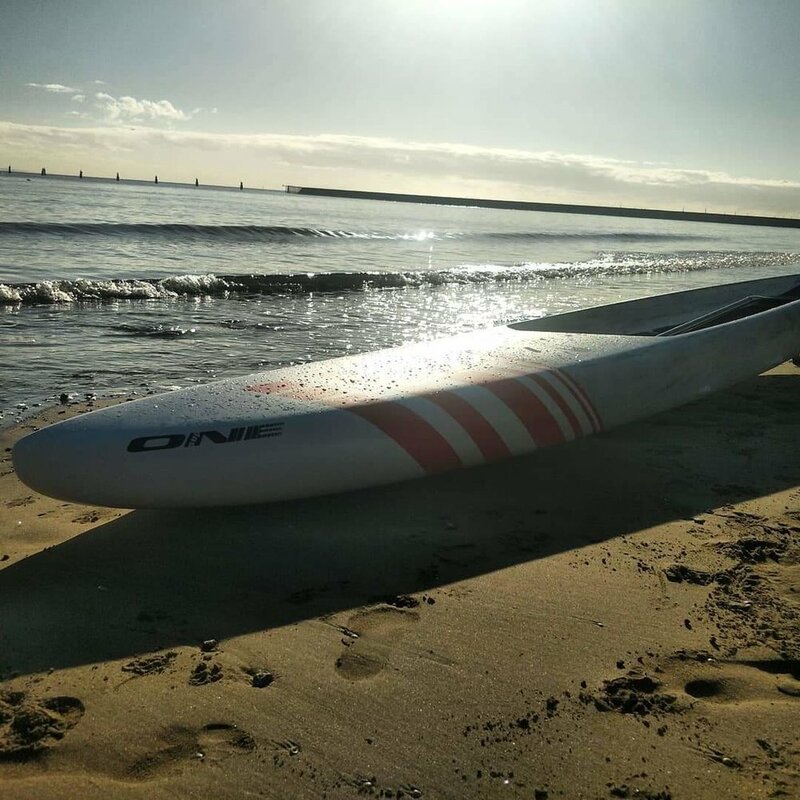 Well, its my go to board now, in flat water, does this mean it will smash a dedicated flat water board, no, but its good enough to make flat water training fun (well as fun as grinding can be) it keeps up with most boards and lets you concentrate on the improvement of technique and cadence. Does it mean that I can drop the need for my Edge Pro, probably not, but there is probably only about 3 times a year I would use a dedicated flat water board. In our normal bay sessions the board is a bloody joy, short chop and cross swell is sometimes a horribly complex place to have a fun little paddle around but the new Storm has really added to my confidence and so, let me really enjoy some really fun sessions basically surfing around the bay (and if you don’t believe me next time there is a Southerly, or something with a bit of East in it, wander down to Shornecliffe Pier and you will find me surfing the Pier, BIG FUN). When it comes to a downwinder, this is really where the board just shines. I was, up until recently, on a 28 Storm 1, which is an incredible board for downwinding, stable, confidence inspiring. For us, ahem, more generously proportioned crew it is a sports car, scaled up and ready to deliver. With the Storm 2 I am able to drop 2 inches down to a 26 wide and it is every bit as stable as my old 28, but hell is it fast. It’s so quick, that my first downwinder I was finding myself behind the board as it just wanted to hunt bumps and go faster. Once, I worked out that there was a different gear this board had and I just needed to adapt a little. The outcome is a faster, more stable platform to play on. So, how has the new Storm changed things for me? I have my stoke back now, I have less complexity in what board I am going to take and I know that pretty much unless I am doing flat water marathons or competition sprinting then I grab my Storm. I can’t wait to grab the board and do a bay run, or to enjoy some ocean time and I am enjoying my paddling more than ever. So, if you are in the market for a new board, you really should put this one on your list of boards to look at. Flat Deck or Dugout Style Board? Which Style do you need? So you are looking at a new board but are confused on a Dug Out style board or a more traditional Flat deck board, so in this write up we will break down the two and hopefully help clear up the difference between them. This is your more traditional stand up paddle race board and what was mostly around in the early days of SUP racing. Flat deck Stand up paddle boards allow for good movement on the deck of the board, this is very good for in the waves or having to step back and do fast kick turns. You never have to worry about the cockpit of the board filling up with water and waiting for it to drain out. Flat deck boards are easy to get back on if you happen to fall off. They are very good for Technical racing and any kind of beach racing where waves or transitions are involved. They have far Superior water flow around the board as the higher side means the boards can roll around more with out getting water on the deck. EG: the Storm 2.0 with the high volume nose and pin tail which makes a far dominate board for upwind and down wind and easy of use. Can allow for more power to be applied to the paddlers stroke due to the extra stability of standing lower to the water. Can be slightly harder to get back into if you fall out. Can take water in inside cockpit if used in and out through the surf which is not ideal. Overall both styles of boards can be very good and in most cases the key is to look at the conditions you will be paddling as one will stand out over the other. We feel for general paddling for speed and performance the dugout designs can out preform the flat deck boards in a lot of areas besides in wave situations and when it comes to DW the Dugout design can be far better making DW and upwind paddling much easier. Both Style of boards have certain elements they excel. Ask any professional paddler and more then likely they will advise you to have 1 of each, then you will cover all aspects of paddling and be ready for everything. If you are still undecided as to which way to go make sure you contact your local ONE dealer or Distributor and they will also hopefully be able to assit with even more info on what might be right for you. We hope this helps you in choosing between Dugout or Flat Deck style boards, or simply just get 1 of each then you are set. Visit One Blog for more information….